Reason for Reading: I got into Deaver’s Lincoln Rhyme series thanks to a recommendation at Book Crazy, and I’ve found they make excellent slump-breakers. This is the third in the series. Synopsis: Criminalist Lincoln Rhyme and his protÃ©gÃ© Amelia Sachs abandon the bustle of Manhattan for the University of North Carolina, where Rhyme wants to try a highly experimental procedure for quadriplegics, which may be his only hope to get mobility beyond his head and one pinky finger – if it doesn’t make him worse. Before he can even finish his first consultation, the local police are knocking on the door and asking for their help. A teenage boy has been murdered, and two girls are missing. They need Rhyme and Sachs’ help deciphering forensic clues to find them before it’s too late. Why you should read this book: The level of suspense sustained throughout almost all of the book is phenomenal. Deaver doesn’t just keep you on the edge of your chair; he’ll have you wondering if you’re even on a chair, there’s so many twists and turns. A difference of opinion has Lincoln Rhyme and Amelia Sachs locking horns as they try to out-think each other, but a mistake could be a matter of life or death, guilt or innocence. The forensics bits of the book are as interesting as the on-foot pursuit of a killer is suspenseful. Why you should avoid this book: There’s a number of disturbing scenes that might be a bit much to handle for some readers (there’s a lot about creepy crawly bugs, and concern over possible rapes). Some people might call Deaver’s dialogue and writing style realistic; but some people would just call it poor grammar. Some of the secondary characters are rather indistinguishable from each other. ‘A bomb?’ she asked, her hollow voice revealing her dismay. Tomel took the beautiful Browning shotgun with the inlay, which Culbeau coveted as much as he coveted any woman in the county, even though he himself was a rifle man and would rather drill a hole in a deer’s heart from three hundred yards than blow a duck into a dust of feathers. For himself, today, he chose Tomel’s nifty Winchester .30-06 with a ‘scope the size of Texas. They packed plenty of ammo, water, Culbeau’s cell phone and food. ‘Shine of course. Sleeping bags, too. Though none of them expected the hunt to last very long. Also recommended: The Da Vinci Code by Dan Brown; Messiah by Boris Starling; Birdman by Mo Hayder. Also by this author: The Sleeping Doll; The Cold Moon; The Twelfth Card; Garden of Beasts; Twisted; The Stone Monkey; The Blue Nowhere; The Vanished Man; Speaking in Tongues; The Bone Collector; The Devil’s Teardrop; The Coffin Dancer; A Maiden’s Grave; Praying for Sleep; The Lessons of her Death; Mistress of Justice; Hard News; Death of a Blue Movie Star; Manhattan Is My Beat; Hell’s Kitchen; Bloody River Blues; Shallow Graves. Fun tidbit: The Empty Chair won the “W.H. Smith Thumping Good Read Award” in 2001, which has the critera of being an “accessible and a page-turning good read,” rather than being judged simply on literary merits. 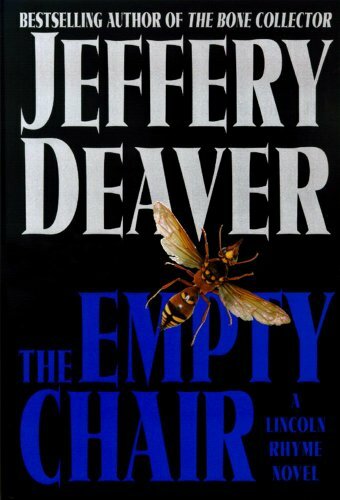 I agree with you that Jeffery Deaver put relentless suspense in this book but “The Empty Chair” lacked typical jeffery deaver thrill in initial few pages. Even though a little insipid start, it is a must read as Jeffery Deaver lets the suspense, thrill, intrigue roll in ensuing pages.